In the 1950's the area changed with new homes and business's. Lorain annexed more land from the township. The first area was south of East 36 St. and along the top of the Black River Valley. This area is known as the Homewood Allottment. Then during the 1950's to 1970's Lorain annexed more of the township west of Route 57 (Grove Avenue), until Lorain reached its present borders. In 1964 the Lorain County Metro Parks aquired the land for the French Creek Reservation. In the late 1960's Interstate 90 cut across the village. A interchange was built on Detriot Road (Route 254). Development of business's soon followed. In the township Sheffield Centre was built, it has resturants, food stores, and a movie theatre. On Harris Road, a new Brookside School opened in 1968. During the 1970's more development happened along Detriot Road. Along French Creek Road small business's and manufacturing firms opened. The village is a great place to build, because of the interstate highway. During the 1970's and 1980's, researchers were studing the Indian sites along the Black River. They are the Eiden, Burrell Fort, and Bungart sites, and they are on restricted Metro Park land. In 1994 The Metro Parks aquirred the land in the Black River Valley, now it is the Black River Park. A 3 1/2 mile paved bike trail follows the river through the park. The land in the park under the Garfield Bridge was owned by the Betzel Family. Along Abbe Road (Route 301) new housing developments came. During the 1990's more commerial development occurred, fast food places were built along Detriot Road. A shopping plaza soon followed behind the other business's. Mike Bass Ford moved from Lorain to a spot by the I 90, Detriot Road area, and expanded shortly after. Along Abbe Road, Barkwood Estates housing development, was constructed. Sheffield Crossings shopping plaza opened in 1997, along Detriot Road. And in late 1998, Cobblestone Crossing retail complex broke ground. It is expected to be open in 1999. In November of 1999, Regal Cinema opened a 20 screen theater at Cobblestone Square, and it can be seen from I90. In the spring of 1999, construction of the new Garfield Bridge started. It will be built just south of the exisisting bridge. The new bridge is expected to be finished in 2001. The old bridge will be blown up. An Industrial Park is being planned along I90, north of Detriot Road. It is called the French Creek Business Park. On May 10, 2008, the Steel Mill trail opened to the public. It connects to the Black River Trail at E.31st St., and goes north for 2 miles. It passes the steel mill, and goes through the slag dump. One hunderd years ago, in 1908, you would be 40 feet lower walking through the same area! 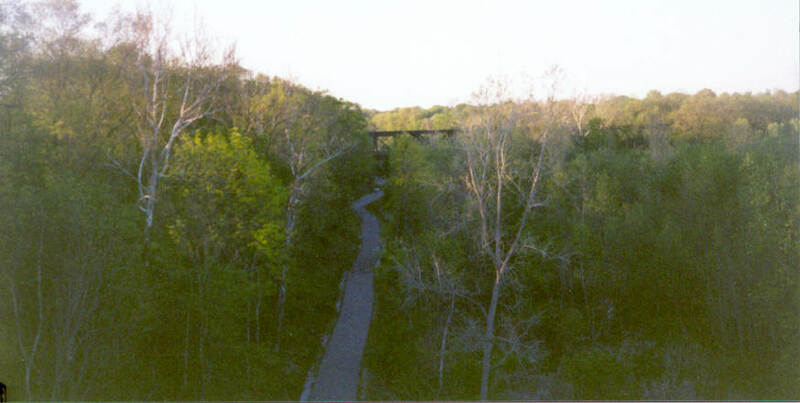 The photo below is of the view of the Black River Park, from the Garfield Bridge. It is look north, and in the distance is the historic Lorain & West Virginia Railroad Bridge. I have used many sources to compile this Web Site on Historic Sheffield. But mostly Eleanor Burrell, who shared with me, stories of her families, and of the interesting homes and times they lived in. The early history of the Township in part is from Williams History of Lorain County, published in 1879. The other part, including the school history is from Sheffield published by the L.C.M.P.D., Edited by Doris Burrell in 1970. The history of the Steel Mills is from maps, and books at the Lorain County and Black River Historical Societies, and Lorain County Offices. Several People assisted me in this history, they are Susan Brewer, Eleanor Burrell, Mr and Mrs Ben Norton, Sandy and Elmer Klingshrin, and Karis and Linda from L.C.H.S. Plus my numerous hikes along the Black River, French Creek and visiting the Garfield Cemetery. Sheffield Home Page: To return to the home page click here.